1) I no longer finish books I don't enjoy. I used to force myself to finish books, even if they were painfully difficult for me to read. I'd hold off on reading any other books until I finished my current one, which unfortunately meant that I probably had a year or two during which I read zero books. 2) I read more than one book at once. I used to prefer to focus on one book at a time, but now, I allow myself to start multiple books simultaneously. The reason is more practical than wanting to finish books quickly. I occasionally find myself waiting at an appointment or for a friend to arrive, but I may not have a physical book on-hand. In those cases, I'll usually read an ebook. I also have books that are too big or heavy to carry with me. In those cases, I'll bring a smaller book to read while I'm on the go. 3) I skim books that might contain valuable concepts but aren't written in a style I enjoy. I've come across a number of books that are written in a style that I find difficult to read, but I still find the concepts interesting and informative. I quickly skim these books to get the gist, and if the concept is something I find particularly valuable, I take notes or pull a quote from the book. I try to get through these books quickly though--i.e., in an hour or two. 4) I read every word of books I love. While I've employed a few shortcuts to get through books more quickly, I still love reading. When I find a book that truly resonates with me, I make sure I immerse myself in every word. The last time I felt that way was when I read 10% Happier by Dan Harris. 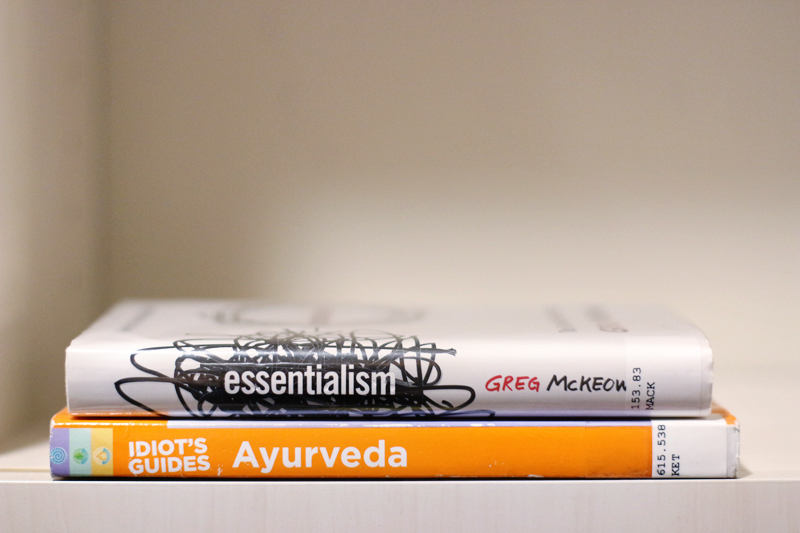 I'm also finding that I've been fully immersed in one of my current reads: Essentialism by Greg McKeown. These are hyggelig books I look forward to savouring during my cozy nights at home. I've just started this book, but I have been eagerly devouring every word. Essentialism is a concept I need in my life. As you can probably tell by this blog and by my YouTube channel, I have a lot of different interests and I want to do a lot of different things. I am quite literally all over the place. I'm hoping this book will provide me with tools to hone in on what I truly want to focus on. While I generally do not gravitate towards books in the Dummies or Idiot's Guides series, I love Sahara Rose, and I was fascinated by her story on how she came to write this book. I'm in the early stages of this book, which I admittedly am skimming, but I've already learned a few interesting concepts that I hope to apply in my daily life. I'll be taking notes as I read the rest. I finished this ebook not too long ago, so it is not pictured above. I became aware of Samin Nosrat after listening to her interview on The Tim Ferriss Show, and I fell in love with her personality. I loved her even more after I watched her Netflix series. And I loved her even more after I read her book. I particularly enjoyed the first half of her book, which contains practical advice on how to cook anything, and she explains the a bit of the science behind cooking in an easily digestible manner. I've never been too interested in science, but I've experimented a lot in the kitchen, and it was neat to learn the science behind some of the techniques I've "discovered" over the years through trial and error. Reading her book made me feel more confident in the way I cook, namely with using recipes as guides but not as gospel. She's like your BFF in the kitchen--encouraging, informative, and just as excited about food as you are.